“I say I’m going to retire, then the next thing I know I’m going back over to the center working,” says Evelyn Payne, a volunteer at Northside Community Center’s emergency food program for over 30 years. Payne, 87, volunteered with the food bank program when it was run by Food Gatherers. The program is now run by Catholic Social Services of Washtenaw County and Payne serves the center as an RSVP volunteer. 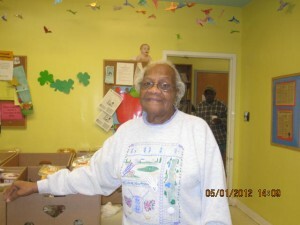 She started volunteering at the center when she retired from Mercywood Hospital, a former mental hospital in Ann Arbor. In addition to Payne’s volunteer work, she has also recruited several of her children to help out at Northside. She and her husband had eight children but working full-time was no problem, she says. “My husband worked nights and I worked days. It wasn’t bad at all and I enjoyed it. I loved every bit of it for 25 years. I loved my teenagers (at the hospital) as well as adults,” Payne says. Some people like to sit when they retire but Payne likes to stay busy. In addition to working at the food bank, she volunteers in numerous ways at her church, Bethel A.M.E. Besides volunteering, she said she likes bingo, music, puzzles and reading. “When I get tired of working on a puzzle I come back up and catch up on my reading,” Payne says. At the food bank, Payne manages the area where people come in and select their food. Allowing people to select their own food means that people get what they like to eat so there is less waste. But Payne monitors how much each person takes, carefully following the rules. “Everybody gets the same (amount.) I tell (the consumers) to think about the next person behind you. You try to stretch it as far as you can,” Payne says. “She helps keep it managed so there’s enough for lots of families,” says Stephanie Fialkowski, who works in housing support for Catholic Social Services. “She can be a pistol. She’s assertive in a way that’s loving and strong-willed at the same time,” says Kimberly Green, the food program coordinator for Northside. Green said she’s worked with Payne for about 12 years. The food program serves about 150 people a week. In addition to food people can get help in finding resources for other things such as utility assistance and rental help, Green says. The emergency food program is open on Tuesdays, Thursdays and Saturdays. For more information, call 734-662-4462.